Electric car startup Byton is back. After unveiling its M-Byte Concept vehicle back at CES in 2018, it's returned to Las Vegas, Nevada for CES 2019 with news that the M-Byte will be available before the end of 2019. There will be two models of the all-electric M-Byte, with the entry level model offering up to 250 miles on a single charge and starting at $45,000 (around £35,000, AU$63,000). There will also be a model with a bigger battery, which will offer up to 320 miles from one charge. The M-Byte comes loaded with innovative features, and it's the first car to offer full connectivity on the go with multiple antennas and 5G support built in. Inside, the main attraction is the huge, 48-inch display which spans the entire width of the vehicle (that's the size of seven tablets or 24 smartphones). The look of the interior has been updated over the concept for the production version, but the huge screen remains, as does the 7-inch 'driver tablet' which is mounted in front of the steering wheel. The tablet doesn't rotate with the steering wheel though, keeping it orientated correctly the whole time. Physical buttons and stalks have also been included on and behind the wheel, to provide quick, safe access to core features and provide a still-familiar look and feel for drivers. Another screen has been included as well, with an 8-inch display housed between the front two seats of the Byton M-Byte. This is more for the front seat passenger more than the driver, but you'll also be able to use voice and gesture control as well. The Byton M-Byte also comes with level 3 autonomous driving, which would allow the driver to take their eyes off the road and leave driving tasks entirely up to the car, but they may be called on at limited times to perform an action. Amazon Alexa is integrated into the Byton Byte OS, allowing you to harness the power of the smart voice assistant, from controlling music and navigation, to buying products and making dinner recommendations and bookings. 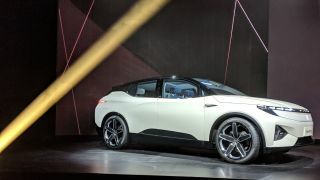 Byton OS packs in a whole host of features including navigation, vehicle performance, communication (including 5G connectivity and multiple antennas), entertainment, productivity tools and facial recognition and can be controlled in a multitude of ways including voice, hands gestures and touch. There's also a reduced set of buttons for key functions. However, there's a risk Byton is packing too much into its car, and as we watched a video promo for the interface, with pinch, swipe, pinch and tap actions for a wide range of functions, the operating system could well have a steep, and potentially confusing learning curve. These touch inputs could distract the driver, and keep their eyes off the road for longer - especially if the inputs don't work first time. Byton says its interface is intuitive, but we'll have to wait and see when the cars roll off the production line. The Byton App is already available on iOS and Android, and it's the only one the firm will offer. It will be an all-in-one solution for all customers and in future Byton claims it will have all car related functions in the app. At the moment the app is rather more limited, where you can configure a car (including picking colors, wheels and interior), get a 360 view around the M-Byte and open the doors, and there's an AR mode which lets you experience the car in the real world. Want to know what the M-Byte will look like on your drive? You can do just that. For wannabe owners you can even place a reservation for free via the app - although Byton is yet to announce which countries it will bring its car to first. It also had its K-Byte concept car (announced in 2018) featuring a digital grille, which certainly looks cool, but we're not too sure how practical it'll actually be day-to-day. The K-Byte will be available from 2021, and Byton says it will launch a third model in 2023.